What’s the verdict? 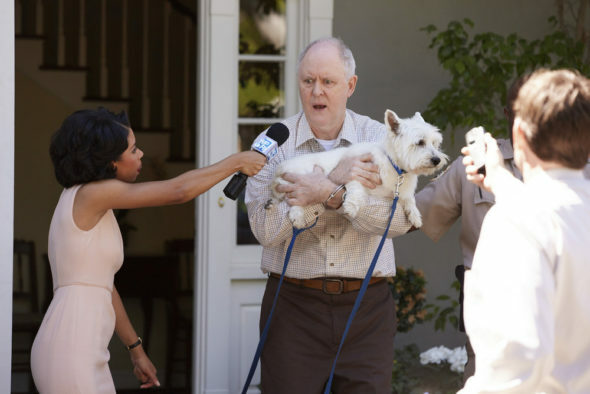 Has the Trial & Error TV show been cancelled or renewed for a second season on NBC? The television vulture is watching all the latest cancellation and renewal news, so this page is the place to track the status of Trial & Error season two. Bookmark it, or subscribe for the latest updates. Remember, the television vulture is watching your shows. Are you? A sitcom airing on the NBC television network, the first season of Trial & Error stars Nicholas D’Agosto, John Lithgow, Krysta Rodriguez, Steven Boyer, Jayma Mays, and Sherri Shepherd. The story centers on new lawyer Josh Segal (D’Agosto). To tackle his first case, this New Yorker sets out for the tiny Southern town of East Peck. There, he must defend eccentric, “rollercizing” poetry professor, Larry Henderson (John Lithgow), who is charged with murdering his wife. The defense team includes a bunch of quirky locals: Larry’s daughter Summer Henderson (Rodriguez) and former cop and lead investigator Dwayne Reed (Boyer), as well as Carol Anne Keane (Mays) and Anne Flatch (Shepherd). The first season of Trial & Error averaged a 0.92 rating in the 18-49 demographic and 3.86 million viewers. Find out how Trial & Error stacks up against other NBC TV shows. On May 20, 2017, Trial & Error was renewed for a second season which will debut on July 19, 2018. Stay tuned for further updates. NBC has had mixed results with its freshman comedies during the 2016-17 television season. Although a cancellation seems likely for Powerless, The Good Place did well enough to earn a second season. Which path will Trial & Error ultimately follow? It premiered to mediocre ratings and the numbers have been falling lower and lower. I suspect it will be cancelled, but the decision will ultimately come down to money. Subscribe for free updates on Trial & Error cancellation or renewal news. 5/21 update: Trial & Error is renewed for season two on NBC. Details here. Find more Trial & Error TV series news or other NBC TV show news. What do you think? Are you glad that NBC has renewed Trial & Error for a second season? How many seasons do you think this TV series will run? BRING IT BACK!!! One of the most hysterical comedies in a long time! A GREAT show!